The buttercream frosting ingredients that make up Wilton buttercream are pretty standard. Also known as “American buttercream” or “crusting buttercream”, this type of icing is known to be sturdy and sweet, compared to some European style frostings (some of which require additional cooking, which this buttercream does not). What sets Wilton buttercream apart from the rest is its ability to “crust”. This means the outer surface of the buttercream sets and becomes dry to the touch, creating a stable texture for decorating and smoothing techniques. This is especially useful for spatula painting your cakes, image transfers and piping decorations with crisp detail (like flower petals or borders). But to get that perfect crust on your icing, you need the right ingredients, starting with one of the most important of the group – the fats. It’s no surprise that the basis of buttercream icing is butter. Rich and delicious, butter adds great flavor to your icing and when used with a little pure vegetable shortening, can create an icing that will stand up to all kinds of decorating tasks. While you certainly can make an all-butter or all-shortening icing, we suggest using a little of each ingredient to get the best of both worlds. For a rich and creamy flavor in your icing, butter is key. We suggest using a good-quality unsalted butter for tasty results every time. For those who want to use margarine instead, go for regular margarine rather than low-fat. Low-fat margarine tends to have a higher water content than regular margarine or butter and that extra water will affect the consistency of your buttercream. What butter does for flavor, shortening does for texture and stability. Shortening helps create a light and fluffy icing while also providing a neutral flavor to help cut the richness of the butter. Icing made with shortening also tends to hold up better to time and temperature, so be sure to add shortening if you’re planning to pipe buttercream flowers or borders or if your cake will be sitting out at room temperature for an extended amount of time. If you’d rather use one or the other, that’s fine, too. An all-butter icing will be flavorful, but a bit heavy and prone to melting and drooping. Keep cakes iced with an all-butter icing refrigerated for as long as possible to prevent melting. An all-shortening recipe (also known as “pure white icing” or “snow white icing”) will be very sturdy and fluffy, even in warm climates. This type of recipe is great for piping buttercream roses, flowers and borders. If using an all-shortening recipe, keep in mind that flavoring will need to be added, as shortening has no taste (see more on flavor below). Confectioners’ sugar – otherwise known as that powdery white sugar that gets everywhere – is essential for keeping the consistency of your buttercream nice and smooth. Also known as powdered or icing sugar, confectioners’ sugar contains a small amount of cornstarch, which prevents caking. The cornstarch, when mixed with a liquid ingredient, also helps to thicken your buttercream. Unfortunately, not all sugars are created equal. The powder-like consistency of this ingredient is what makes it essential to buttercream, so granulated sugar or even superfine sugar cannot be used as substitutes. If you cannot find confectioners’ sugar in your area, try grinding granulated sugar in a food processor until it turns into powder, then sift it to remove any large granules. While we use vanilla extract to flavor our buttercream, you can use any extract, flavor paste or emulsion to add a depth of flavor to your icing. Try peppermint extract around the holidays or a tasty fruit-flavored extract for a spring or summer treat. For a more natural taste, use emulsified blueberries or strawberries for a delicious icing that would taste great on any cake! If you’re using a liquid flavoring such as extracts, keep in mind that it may thin down the consistency of your buttercream. If your icing becomes too thin, add confectioners’ sugar, about 1 tablespoon at a time, until you reach your desired consistency. Traditional vanilla extract may also add a slight tint to your buttercream, especially if you’re making an all-shortening recipe. To maintain a bright white buttercream, we suggest using Wilton Clear Vanilla instead. In order to get the perfect consistency for your buttercream, a liquid ingredient may need to be added. While you can use water, we suggest using milk, heavy whipping cream or half-and-half to add extra flavor and creaminess to your icing. Nut-based milks will also work, but may add a light flavor as well. When it comes to liquid, a little goes a long way. 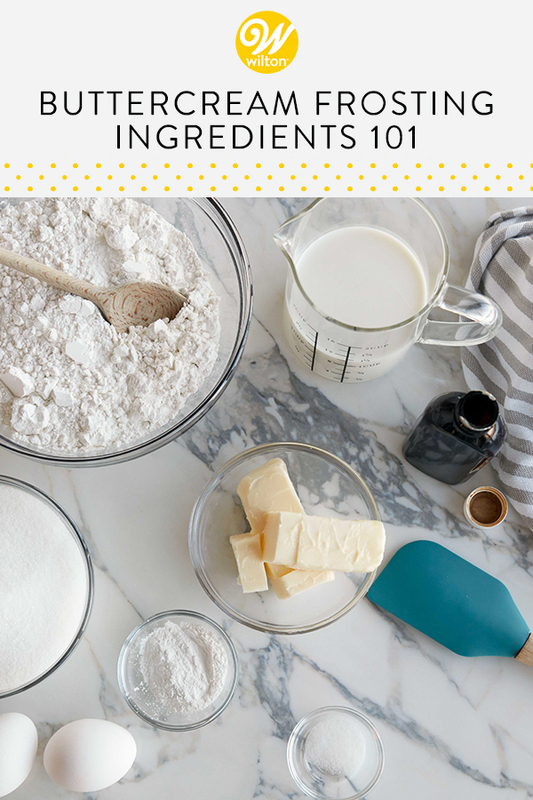 To ensure that you get the right consistency without ruining your buttercream, add half the amount of liquid called for in the recipe (especially if you’re also using a liquid flavoring). Check for consistency, then add more liquid if needed. For filling, crumb-coating and icing cakes, we suggest a medium-consistency icing. For piping decorations like flowers and borders, stick with a stiff-consistency buttercream. Check out our article on Buttercream Icing Consistency for more information about how to thin or thicken your buttercream. You may think salt is a strange ingredient to add to buttercream, but it does wonders for enhancing flavor and cutting through the sweetness of this icing. If you’re using table salt or kosher salt, let it dissolve in your liquid ingredient for a few minutes to prevent granules in your icing. If you’re using superfine salt (or popcorn salt), you can add it to your mixture along with the confectioners’ sugar. Superfine salt is also good for adjusting taste after your buttercream has been made. If your icing is done and you think it’s too sweet, superfine salt will easily dissolve into the buttercream more evenly than table salt, so you can better balance the sweetness. However, if you’ve got a sweet tooth and love nothing more than a yummy, sweet icing, you can omit the salt altogether! A delicious, versatile icing is a must for any baker or decorator, and with the right ingredients you can create a buttercream that’s literally the icing on every cake! Do you have any other icing tips and tricks to share? Let us know in the comments below! I find butter to be best and add a little meringue powder for stability when piping flowers or I’ll use royal icing. Also finding Italian buttercream to be a very nice frosting option to reduce sweetness.